Napoli welcome Swiss side FC Zurich to the Stadio San Paolo on Thursday night for the second leg of their Europa League last-32 encounter. 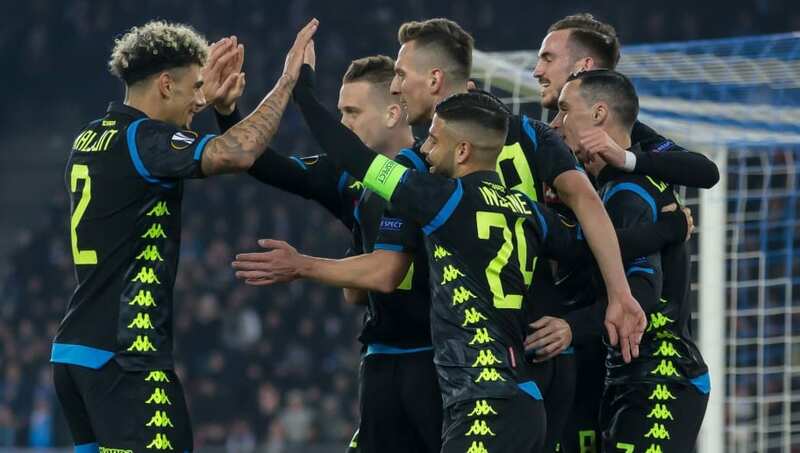 The Serie A side appear to be in a comfortable position for the return fixture, after goals from Lorenzo Insigne, Jose Callejon and Piotr Zielinski gave them a 3-1 advantage at the Letzigrund Stadion in the first leg. The aggregate score heading into the game means that Zurich face a huge uphill task in progressing to the next stage of the competition, with ​Napoli potentially able to rest some first-team players thanks to their three away goals. Here is 90min's preview of the European clash in Naples. Napoli manager Carlo Ancelotti may use his side's commanding position in the tie to give opportunities to some fringe players. He will however be unable to select Mario Rui or Raul Albiol, as both players have missed the Partenopei's recent fixtures with muscle injuries. FC Zurich have plenty of injuries to contend with for Thursday's match, with Pa Modou Jagne, Izer Aliu, Fabian Rohner and Michael Kempter all unavailable for the Swiss club. Kosovan international Hekuran Kryeziu will also be unavailable for the game, after picking up a booking during the first leg, meaning the midfielder will be suspended for the second leg clash. Napoli Meret; Ghoulam, Maksimovic, Koulibaly, Malcuit; Callejon, Allan, Diawara, Zielinski, Insigne, Mertens. Zurich Brecher; Ruegg, Bangura, Maxso, Kharabadze; Khelifi, Palsson, Domgjoni, Kololli, Winter; Marchesano. The first leg of this tie marked the first ever meeting between Napoli and FC Zurich. Napoli eased to victory, despite Benjamin Kololli's cheekily chipped penalty late on for Zurich. Napoli's victory last Thursday night was the club's first ever competitive win in against Swiss opponents in Switzerland, with Lorenzo Insigne's early goal also marking the club's first ever goal in the country. The Partenopei can boast a 100% home record against Swiss clubs however, having beaten Grasshopper, Wettingen and Young Boys at the San Paolo throughout their history. FC Zurich have a torrid record against Italian sides. winning only two of 11 games. They have however had some success in Italy, having beaten ​AC Milan 1-0 at the San Siro in the 2009/10 Champions League group stage, thanks to a goal from Finnish defender Hannu Tihinen. Napoli were left hugely frustrated in their last match, after being held at home to a 0-0 draw against Torino in Serie A, despite having 26 shots during the game. This has been a regular occurrence for Carlo Ancelotti's men of late, as they have failed to score in four of their last six games. Despite a lack of cutting edge in recent games, Napoli still lie in second place in Serie A, however the gap between themselves and leaders ​Juventus has grown to 13 points, making a title challenge unlikely. After being comfortable beaten by Napoli in Europe, FC Zurich resumed their domestic campaign with a 2-0 defeat away at Young Boys. Ludovic Magnin's side sit fourth in the Swiss Super League, and are currently in the midst of some poor form, having only won once since their return from their annual domestic winter break, beating local rivals Grasshoppers 3-1 earlier this month. FC Zurich did not show a lot of quality in the first leg, as they were sloppy in possession and barely threatened Alex Meret in the Napoli goal. Napoli are one of the favourites to lift the Europa League trophy in Baku come May, and are likely to still name a strong team on Thursday night in order to ensure they progress to the next round in comfortable fashion.